A grape vine has escaped the neighbor’s yard. It is trailing over their fence and tantalizingly hanging over the sidewalk. Do you pick a bunch? I do. 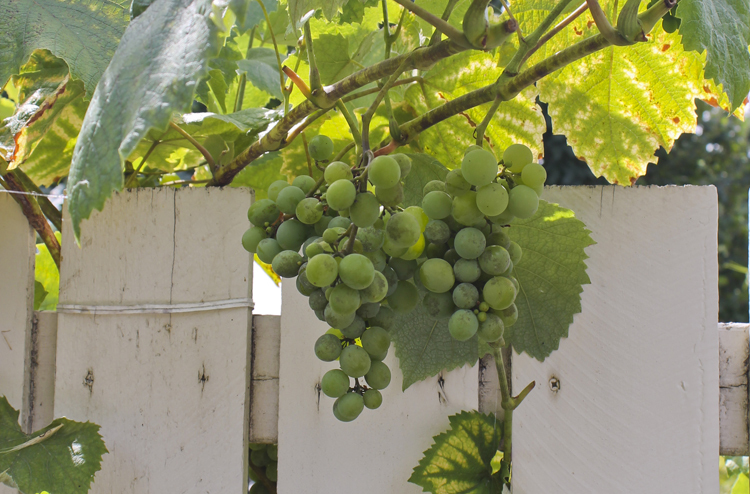 It’s now off their property and if the vine is growing lusciously, surely they have tons of grapes behind their wall. According to The American Heritage® Dictionary of the English Language, 4th Edition, usufruct means “The right to use and enjoy the profits and advantages of something belonging to another as long as the property is not damaged or altered in any way.” It comes from the Latin words for “use” and “fruit.” Usufruct laws apply to urban foraging by legally allowing someone to harvest fruit from another person’s tree or herbs from another person’s shrub. Unfortunately, most U.S. cities do not have usufruct laws, so by taking those aforementioned grapes, I might be stealing. As far as I know, Portland has no usufruct laws. (And I wouldn’t have any idea who to ask. If you do know who to direct such questions to, let me know in the comments.) It would certainly be good to have those laws clearly spelled out, if only to reassure potential (but nervous and polite) foragers that taking fresh food when it is plentiful is a legitimate practice and most likely beneficial to all parties. The owners of the tree may not be able to harvest the full bounty and will most likely stick to the parts of the tree/vine/etc that are within the property boundaries, the parts that are easiest for them to get to. The rest of the food may go to waste. By taking it with you, you are preventing moldy fruit from collecting on the sidewalk, that the residents would be responsible for. Don’t go into the yard. Take the food that is outside the boundaries. Don’t be a locust. If there isn’t very much fruit on the trees, be respectful and make sure there is more than enough for the tree owner. Keep in mind that other people may have the same idea and want their share. Be bolder when the fruit is about to spoil and more meek when the first fruits have ripened. That so awesome. What great neighbors! You might check with one of the “gleaners” groups in the area…they probably have a good idea of the legality of picking fruit/veggies.